Senior IT Project Managers Roya Noory (seated center) and Carl Konzman (standing) work with three of the high school students. Staff members from the NRC’s Office of New Reactors (NRO) and other agency employees got a first hand and up-close look at the future during the recently held IT Shadow Day. What they happily learned is that if the participating students are any indication the future of information technology is bright. 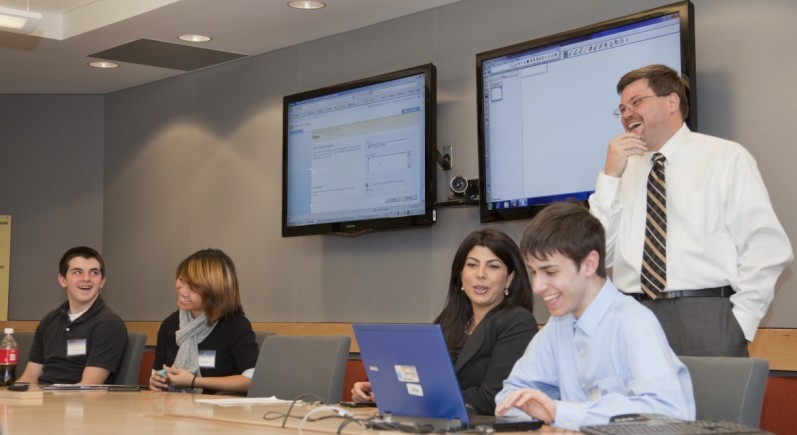 Twenty-five students from Gaithersburg High School’s Academy of Information Technology and its Academy of Finance participated in the fifth annual event at agency headquarters in Rockville, Md. Among the senior agency officials who spoke to and interacted with the students were Deputy Executive Director for Corporate Management Darren Ash, Chief Financial Officer Jim Dyer and Office of Information Services Director Tom Boyce. After arriving at NRC headquarters via the Metro and downing a quick breakfast, the eager and receptive young minds “shadowed” various agency IT (and other) staff members who volunteered to share with them exactly what their jobs entail on a daily basis. The students also toured the agency’s Operations Center, Data Center and Video Conferencing Center. Following welcoming remarks and a brief overview of the office mission and responsibilities, three of the students — Rena Cando, Jimmy Lutz and David Hann — shadowed NRO IT professionals Beverly Holmes, Roya Noory, Luc Phuong and Carl Konzman. The trio learned about current office initiatives in web site development, programming, design methodology, development style, project management and the growing relationship between communications and information technology. Ms. Holmes observed that sharing her on-the-job experiences with the students proved uplifting. The other NRO participants voiced similar thoughts, encouraged by the youthful energy level and intellectual curiousity of the students. “It’s great to see that high schools now support a broader awareness of information technology by providing students with the opportunity to experience IT as applied beyond what they may believe it is about,“ said Ms. Noory. The students were equally as ethusiastic and impressed. Fellow student David Hann, an 11th grader, said that spending time with members of NRO’s staff made it clear there is much more to the IT profession than “a bunch of people behind computers.” Hann said he hopes to secure an internship at the NRC in the not-too-distant future. Like I said, the future is bright. Wow! They look so great! How I wish to be like them… More power guys! Thisis great idea!! Such projects allow students to learn more about their future profession. Thank you for doing this.